Z. S. Liang was born in China and raised in a family of artists. He studied at the Central Academy of Fine Arts in Beijing and Guangzhou Academy of Fine Arts in Guangzhou. Liang furthered his art study in the United States in 1982. He earned his BFA in painting at Massachusetts College of Arts in 1986 and his MFA in Painting at Boston University in 1989. Liang received his great inspiration in this country while studying and painting the Wampanoag Indian culture at the outdoor Museum in Plymouth, Massachusetts. This newfound interest fired his imagination, and he began to focus his painting primarily on Native American Indian cultures and their traditional ways of life. During the ensuring years of field research, he has made many connections and friends among Native tribes from the East coast to the West coast. Liang’s obvious passion for the Indians as a people, coupled with his emphasis on historical accuracy, adds strength and truth to his portrayals. 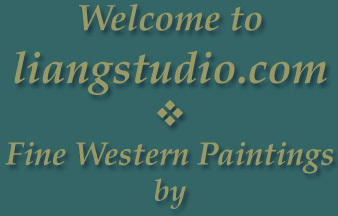 Liang is represented by Trailside Galleries in Jackson, Wyoming and Scottsdale, Arizona. Giclee reproductions of his work are available through Greenwich Workshop dealers. ©1999 - 2015 Liang Studio, All rights reserved.